My Memama (mom’s mother) used to have shelves and shelves of canned goods in her basement for as long as I can remember, her bread and butter pickles were among my favs! Now that I have cucumbers coming out of my eyeballs I thought I would share her pickles. They rock!! Step 5: after filling wipe around top of jars with a damp towel then place lids on jars, loosely screw on rings and allow to cool on counter and wait for that “pop” sound and you will know they are sealed! I store my pickles in the door of my extra fridge, in the pantry, anywhere I can find space!! I like to allow them to set or settle for at least a week prior to eating. When we open a jar we tend to polish off the entire jar at one meal! 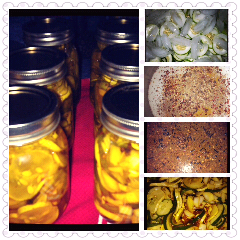 Cut up another cucumber and toss in remaining liquid, toss in fridge and enjoy another quick & easy batch of pickles! This entry was posted in Uncategorized and tagged bread and butter pickles, canning, Mama Bird's Nest, Mema's Pickles, old fashioned pickles, pickles, sweet pickles.